What age group are you belonging to? One of the special Jerusalem Temple vessels was Menora. It consisted of seven branches and twenty two goblets. 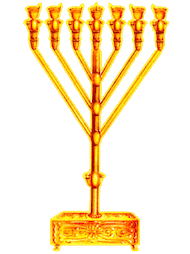 Seven lights of Menora were filled with olive oil each evening and had to burn till morning according to G-d's command. When holding the campaign for spreading Seven Laws among Noah Descendants Lubavitcher rebbe paid a special attention for handing and distributing Chanukia among world state leaders and all peoples of the world representatives despite their beliefs. Why did he do that? And why did he call all Jews to influence other peoples, calling them to observe Seven Laws through Chanukia gifts as well? How could it be that Lubavitcher rebbe advised to present the peoples of the world with traditionally Jewish object of Temple service? We will get the answer to this question if study symbolical meaning of Menora. The matter is Menora represents the wisdom of Tora and personifies intellect. By this reason it was allowed to use only the purest - olive - oil of only first wring (Tora requires our minds get the purest pollution-free information and, desirably, from the first hands). Menora was made out of single piece of gold. It symbolizes the unity of Creator. The gold it was cast in had to be pure, what means: words of G-d are the pure gold, without admixtures. Seven Menora branches mean Seven Laws given to the peoples of the world. There are twenty two goblets at Menora which correspond to twenty two letters of Biblical language Tora consists from and the whole world was created with. And, at last, king Solomon put ten Menoras in the Temple, following the command passed through prophet Moses. Thus there were seventy lights total in the Temple (as far as each Menora has seven branches). They symbolized seventy peoples of the world who have to observe Seven Laws of Noah, which G-d gave to all mankind. But why then it is recommended for the peoples of the world to have Chanukia, but not Menora in their homes? The matter is Talmud (Babylonian Talmud, Tractate Rosh ha-Shana 24a) does not allow to exactly reproduce Temple Menora coz of the prohibition to use the Holy Temple utensils for one's everyday's needs (for even iron Menora is suitable for the Temple in the last resort). So if Menora is fitted for the Temple, one may not do it like that. That's why today Menora is replaced by Chanukia, which is formed as nine-branched Menora. Its lights are symbol for Temple Menora. They are the source of spiritual light that is able to make its way through the most pitch darkness. By the way, in counterweight to Christianity with its cross symbol and to Islam with its crescent, it is exactly Menora (together with Rainbow) that symbolizes true faith for the peoples of the world who observe Seven Laws, by the number of its seven branches. We know when righteous Mashiach (Messiah - Biblical language translation) comes and the Third Temple will be finally built (may it happen soon, in our days) - ten Menoras are going to be put in it again, and their light will shine upon the whole world. It is exactly what the Biblical prophecy says about (Yeshayahu 56:7): "And I will bring them to My holy mount, and I will cause them to rejoice in My house of prayer, their burnt offering and their sacrifices shall be acceptable upon My altar, for My house shall be called a house of prayer for all peoples." That means the coming of righteous Mashiach and reconstruction of Jerusalem Temple anew, will be fulfilled not only for chosen people of G-d - Israel - but for all seventy peoples of the world. Their memory always lived in two previous Temples, encouraging each person who came - it was allowed to the peoples of the world to sacrifice in the Temple - to return to true Creator. Their lights will always burn in new Third Temple. And this is what ChIDA - rabbi Chayim Yosef David Azulai, the famous Sage and Kabbalist of XVII century - writes about when persistently advising to each conscious representative of the peoples of the world to pronounce the ancient Biblical prayer "Shema Yisrael" - "Hear, O Israel" twice per day, in the morning and in the evening. For as Menora is cast in single piece of gold and symbolizes the unity of Creator of the universe, as reciting this prayer by us is an act of recognition of G-d's unity and of full accept of His will upon oneselves. Thus, all said above is a reminding for all of us about what reward awaits for all those who accept upon themselves to observe Seven Laws of Noah Descendants - of his free will and consciously, today already. Coz if in the most sacred places of the Temple there have to constantly be present and burn seventy lights, by the number of seventy peoples of the world - and this their part only in the Temple - then how much is their part in the World to Come, where, we must remind, only those who accepted and carefully observe Seven Laws will be allowed to enter.